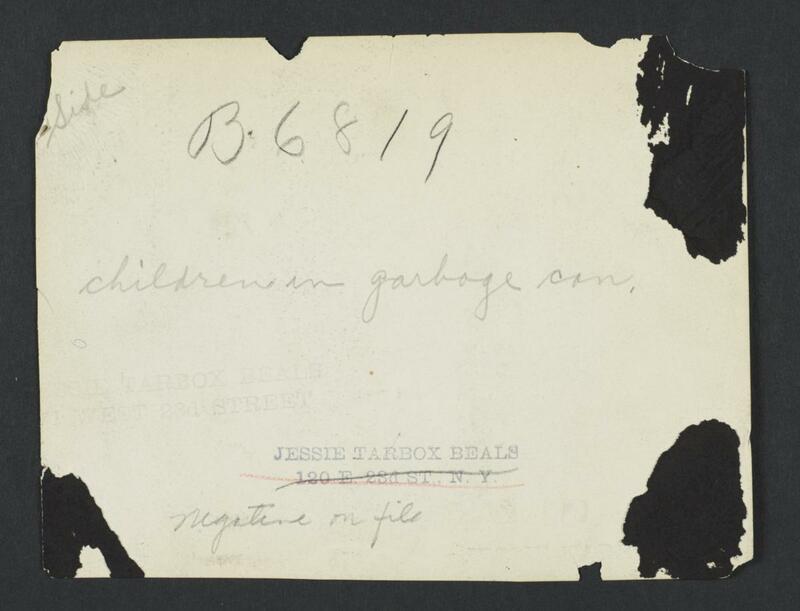 (Negative on file) Box 297 Folder 8 #1891 Stamped Jessie Tarbox Beals In Bagdad on the Subway; A Periodical of Association [AICP] News No. 6, December 1918, p. 5. Girl only, and garbage can, illustration in article entitled, "Annexing Mulberry Bend to the U.S.A." pp. 5-6, 10-11. Caption: In a Mulberry Bend Court. (As anyone can see, the picture was taken on the street, not in a rear court. 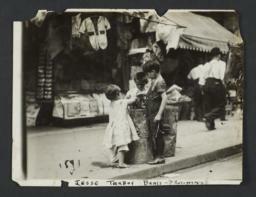 Was a ragged child in a rear court thought to be more touching than one rummaging in a garbage can on the street?) Article begins: "It is in that part of the city of which Jacob Riis often spoke and wrote. It runs from Canal Street south to Houston Street north, from Broadway west to Bowery east. Within that area are three of the Health Department sanitary areas that are among the most congested in the city. . . . "Here it was that the Educational Nursing Bureau of the A.I.C.P. decided last May to attempt some public health work. Prenatal nurses began the work by house-to-house canvass for the purpose of giving to expectant mothers such instruction as should insure a normal,'healthy baby, a well, strong mother prepared to rear her family...."